You want to unite a divided nation? I’ll tell you how to unite a divided nation. What we need is a common enemy. In other words: aliens. That was the logic that drew me to the cineplex yesterday afternoon to see the film Arrival. I was expecting something along the lines of Independence Day, the 1996 sci-fi disaster fun-fest in which viewers are emphatically assured that America is great all right—but only because we have scrappy underdog heroes like Will Smith and Jeff Goldblum! Whose crazy idea works in the nick of time! So the whole world can kick the aliens’ a** (or analogous body part)! Also: explosions! That is not what I got with Arrival. Instead, this film, directed by Denis Villeneuve, manages to be riveting and meditative at once. Rather than marching us through a briskly paced action thriller, Villeneuve invites us to dwell in the mysteries of language, time, and otherness. The story focuses on linguist Louise Banks (Amy Adams), who has arranged her life so that nothing disturbs her somber loneliness. Even when the aliens arrive and the world recoils, her first response is to hunker down and avoid. Until the U.S. Army comes knocking at her door in the form of Colonel Weber (Forest Whitaker), seeking her expertise. They want her to ask the aliens one primary question: What is your purpose on earth? Well, figuring out how to ask that question is going to require months of narrative time and at least an hour of screen time. Not to mention an army encampment at the aliens’ Montana parking spot, a whole team of military tech people, a sidekick for Louise Banks in the form of physicist Ian Donnelly (Jeremy Renner), and—I must say—precious little useful input from similar tech teams at the other eleven sites around the world where alien ships have set up shop. The long second act of the film draws us into bewildering disorientation, puzzles within puzzles. Based on a 1998 Ted Chiang short story called “Story of Your Life,” the plot is driven on the surface by the question How can we communicate with these aliens when we have no idea whether they use sounds or symbols or telepathy … or what? But beneath that question are larger conundrums about perception and reality. While I enjoyed the sustained tension of the language puzzles, the gorgeous camera and sound work kept me even more deeply engaged. Cinematographer Bradford Young lingers long and often on Amy Adams’ expressive face, usually in modes of fearful curiosity, pensive wonder, or at the moment of awakening. When not exploring her character’s quiet intensity, many frames paint with liquid swirls of clouds, mist, water, muted greens, grays, and blues, or simple silhouettes. The sound design by Jóhann Jóhannsson, meanwhile, evokes intimacy and familiarity—whale sounds, foghorns, bird calls, a didgeridoo perhaps—though in weird mixes. In fact, I would see the film again just to listen more closely to its fascinating soundscape. As for that uniting-against-a-common-enemy trope I was hoping for, unfortunately that is not what happens. Instead, across the world, the general public responds to mysterious beings of uncertain intention by engaging in violence, stupidity, and chaos. In the geopolitical realm, which we glimpse only through news reports on screens at the Montana encampment, various nations threaten to abandon joint efforts to communicate, go their own way, and blast their arsenals at the alien ships. At one point, someone at the Montana base suggests that the aliens would be smart to wait for us to turn on each other and make their job easier. Fearful people are divided people. Yes indeed. Some reviewers have complained about the political dimension of the story, suggesting that the standard military brinksmanship plot is predictable and underdeveloped. But it seems to me that the film rightly foregrounds the heart of the story: the great value of patience. Will a fearful and violent world be patient long enough to let the linguists do their work, to let the puzzle pieces come together? Louise Banks and her sidekick Donnelly are willing to be patient, to ride out the disorientation, but they find themselves more and more alone. Knowledge requires patience, communication requires patience, dealing with the other requires patience. And vulnerability, and a willingness to keep a number of interpretations open for a little while. It’s so much easier to run straight at interpretive closure and explode in aggression. The ending, while not an obvious tear-jerker, still has satisfying human depth. 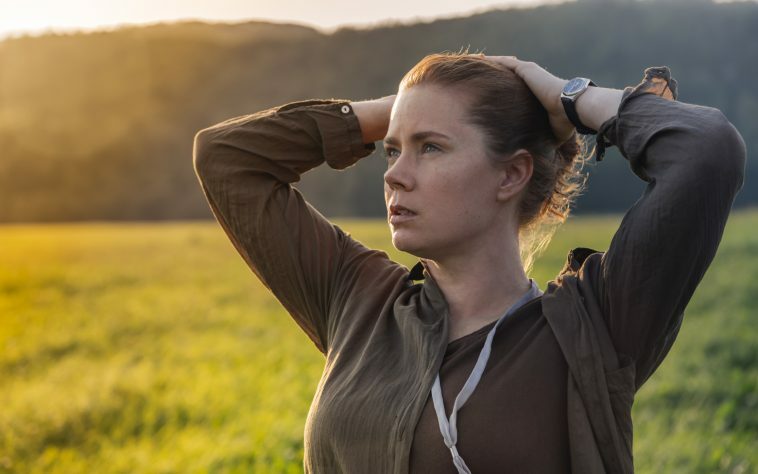 Amy Adams’ character arc remains understated; we have to let her puzzle pieces come together too. The opening and closing sequences float above the plaintive resonance of a string quartet, signaling that this is a chamber piece rather than a film equivalent of an opera or symphony. The people at Pop Culture Happy Hour, in their review of the film, note that often in science fiction, scientist-heroes are called upon in an emergency to learn and teach, and then ordinary masses must listen and heed. That description fits Arrival, but—to my great delight—the hero is not a mathematician or a scientist but a linguist. Hard science certainly is necessary, but what we need even more, this film suggests, is the subtle tool of language. Language, it turns out, is the best weapon, the only one that can transform the hopelessness of adversarial inevitability into hopeful possibility.